Lately I have been busy for various reasons. Thus, my blog entries has been slow with the last entry being almost 3 weeks ago. So many things has been happening over the last 2 months. My hospital life has been busy, almost weekly MMA branch meeting for the upcoming AGM, family matters, politics etc. I became a MMA member since I was a houseman. Currently I am a life member. I have been active in MMA Johor branch since the year 2000 as a committee member and subsequently as Johor SCHOMOS Chairman from 2002 till 2005. I was also the National SCHOMOS Treasurer from 2004 till 2006. I took a break from 2007 till 2011 as I was busy doing my subspecialty as well as starting academic life (Monash) and private practise(from 2010). I went back into the committee in 2012 and subsequently as Johor CME Chairman since 2013. I was well known for my articles in Berita MMA since 2004, many of which has become a reality soon after. All the articles that I wrote in MMA magazine are available over HERE. I stopped writing since 2012 due to some conflict with the editor. 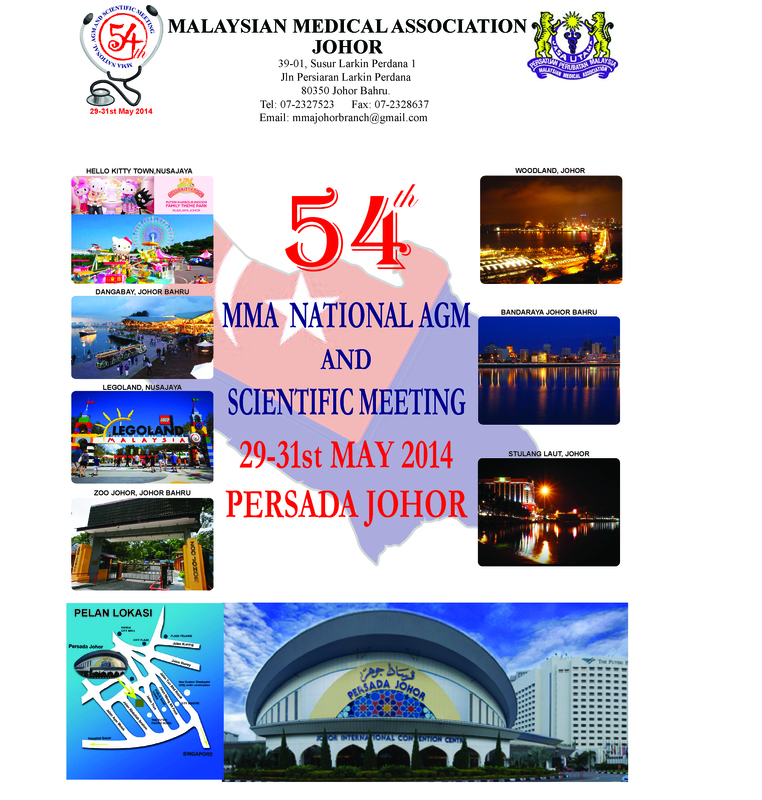 For the first time since 1994, Johor will be organising the National AGM, the 54th. Almost the whole organising committee do not have any experience organising it before. Thus, it was a great challenge to organise this event despite our busy schedule. In fact, I could not attend all the weekly meetings due to my busy clinical life of being On-Call on weekly basis. I was mainly involved in organising the symposium and booths. We all know that the medical field is not what it use to be. Quality has deteriorate and life is not as “easy” as what many would like to think. Oversupply of doctors due to commercialisation of medical education will become a reality soon. I first wrote about this in 2005. MMA is the oldest and only medical organisation that the government talks to. Our current/outgoing President, Dr NKS Tharmaseelan has been one of the most vocal president to date. Many issues were brought forward to mainstream media including the oversupply and quality of doctors. Unfortunately, despite having close to 40 000 registered doctors in Malaysia, only about 1/4 are members of MMA. Many complain about MMA but it is the only organisation that can voice out our issues/grouses. Many in government sector do not know that most of the PERKS that they are receiving now are due to constant discussion between MMA and the government. These includes the time based promotion, on call allowance, specialist allowance etc etc. We may have a number of splinter parties but we still need to work together with MMA to achieve our goals. Medicine is at its crossroads. I hope every doctor would at least become an ordinary member to strengthen the membership of this association and make our voice stronger.I never gave up my MMA membership despite my past dissatisfaction with them. Thus, I hope every MMA member can take a few days off to attend this important AGM in Johor Bahru. It will be held from 29/05/2014 till 31/05/2014. Election for President Elect and Secretary will be held during this AGM. IT will be the beginning of school holidays and thus make sure you bring along your passport for a visit to Singapore or Batam.